Nothing freshens up your appearance like a whiter, brighter smile. The whitening toothpastes at the grocery store just can’t give you the whitest possible smile. 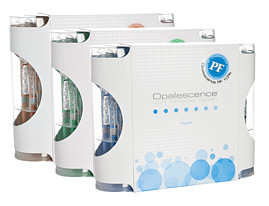 Fischl Dental Associates has been bleaching teeth for over 20 years, and we now recommend the latest in-home whitening technology from Ultradent Products, Inc.’s Opalescence. The liquid gel that safely and effectively whitens your teeth at night or during the day. The FDA has recognized the active ingredient in Opalescence, carbamide peroxide, for many years as an oral antiseptic. This technology is also helpful for removing stains caused by food, coffee, tobacco, aging, and other sources. Today’s bleaching methods are safe for the teeth and surrounding soft tissues, and you can have overnight results! They are fast and simple to use. Maximum results may require bleaching the teeth for two to four weeks. In cases of severe tetracycline staining, bleaching may need to occur for three to six months. The bleaching gel comes in a variety of carbamide peroxide concentrations ranging from 10% to 35% strengths. If you have questions about tooth whitening, please contact Drs. Fischl for more information.